Distinctive features: Tree; Droopy leaves. Classic maple-shaped leaves. Leaves: Opposite/Whorled, Simple, Toothed; Droopy leaves. Classic maple-shaped leaves. Status: Less common than the other maples. Notes: Easily confused with other maples, especially Sugar Maple (Acer saccharum) and Norway Maple (Acer platanoides). Photographs: 45 photographs available, of which 6 are featured on this page. SCROLL DOWN FOR PHOTOGRAPHS. A close-up of Black Maple trunk and bark. Black Maple seed "keys". Note how plump they are. Leaf. 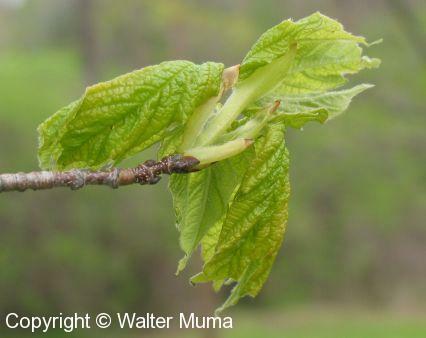 Note that it is very similar to Sugar Maple (Acer saccharum) and Norway Maple (Acer platanoides). However, Black Maple usually has fewer lobes and points than the others. 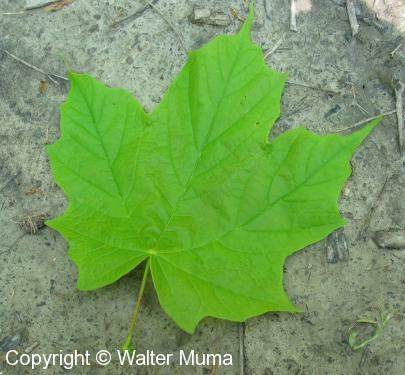 As well, Norway Maple has milky sap, and Sugar Maple leaves aren't droopy. However, note the droopy, wilted look of the leaves. This is characteristic of Black Maple.